The Quick2Wire analog interface board connected to a simple potentiometer for some analog input testing. The analog expansion board uses the PCF5891 interface chip. This has a single digital to analog output channel and 4 analog to digital input channels. All channels are 8-bits wide. To do some initial tests, I’ve connected a 10KΩ potentiometer between the ARef connection (3.3v) and the GND/0v connection. the wiper of the potentiometer is connected to Analog input pin 0. The -x flag tells gpio to use an expansion module – the pcf8591 in this instance. The parameters (separated by colons) or the pcf8591 module are the new pin base number (120 in this case), and the I2C address of the chip (0×48). At that point, you can issue most standard gpio commands, although only the aread and awrite commands are applicable here. 172 * 3.3 ÷ 255 = 2.23 volts. This program will read and print voltages from all 4 ports. *      Read in all 4 analogs on the Q2W analog board. The easiest way to test the analog output is to connect a voltmeter (DVM) to it and set some values manually using the gpio command. should set it to the mid-value, so a voltmeter connected to the output pin should read 1.65 volts. On my board it’s reading 1.63 volts – close enough! 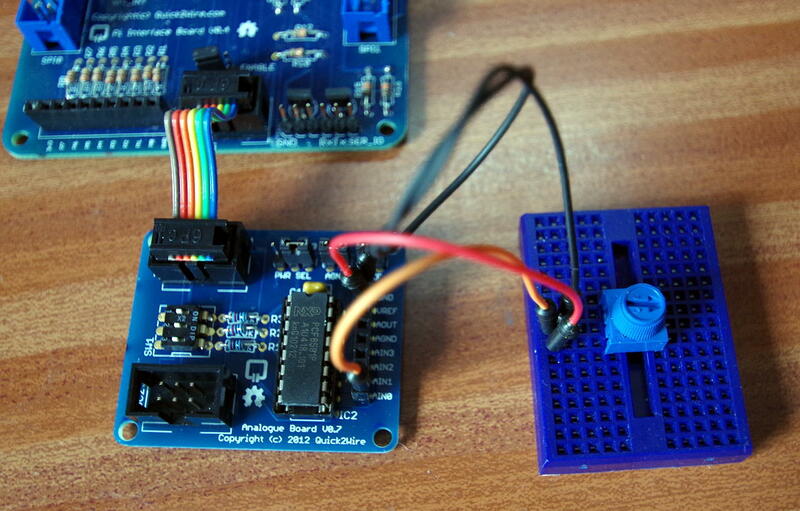 So we’d write analogWrite (pin, 232); to set the output volrage to 3v. The analog IO board provides a useful addition to the Quick2Wire system and can be used to read a variety of sensors from simple resistive light dependant resistors to analog temperature sensors – simple joystick inputs and so on. The analog output could be used to generate simple waveforms on an oscilloscope or for analog control (via suitable buffer/amplifiers) of motors, lights and so on. It’s not the fastest of systems – the maximum sampling speed is going to be about 2000 samples/second and output update speed about double that. Not quite good enough for audio at those speeds but should be more than adequate to read various analog sensors and so on.